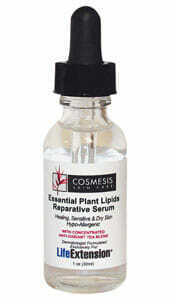 Essential Plant Lipids Reparative Serum is a moisturizer and promoter of intense skin restoration. 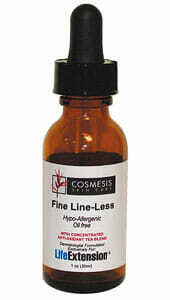 It is a fragrance free & preservative free complex of plant derived lipids fortified with potent antioxidant tea extracts. Excellent for dry & sensitive skin & allergy prone people. Renowned dermatologist Gary Goldfaden, M.D. has developed novel solutions for the most common skin problems encountered by maturing adults. Based on extensive clinical testing, this formula is designed with potent antioxidant tea extracts (red, green, and white) to correct specific areas of concern, such as darkness and puffiness under the eyes, fine lines, rough skin, loose skin, and more. 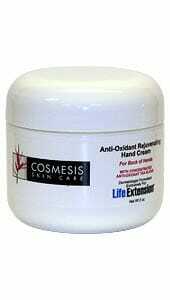 This product can be used in conjunction with any other skin treatments or products. They are specially formulated exclusively for Life Extension. Previously known as Precious Drops, Essential Plant Lipids Reparative Serum is a super reparative moisturizer and promoter of intense skin restoration. It is a fragrance free and preservative free complex of plant derived lipids fortified with potent antioxidant tea extracts. This product is excellent for sensitive skin, allergy prone individuals, and extremely dry skin. It can be used frequently throughout the day. Can be used daily, preferably after exfoliation.